The Anker Advantage: Join the 10 million+ powered by America's #1 USB Charging Brand. Exclusive PowerIQ Technology: Detects your device to deliver its fastest possible charge speed up to 1 amp. High Capacity-Size Ratio: Adds over one charge (over 14 hours talktime) to an iPhone 6, almost one full charge to a Galaxy S6 or at least one full charge to most other smartphones, from a compact lipstick sized charger. Ultra Compact: Our original lipstick-shaped aluminum design (3.7 _ 0.9 _ 0.9in, 3oz). 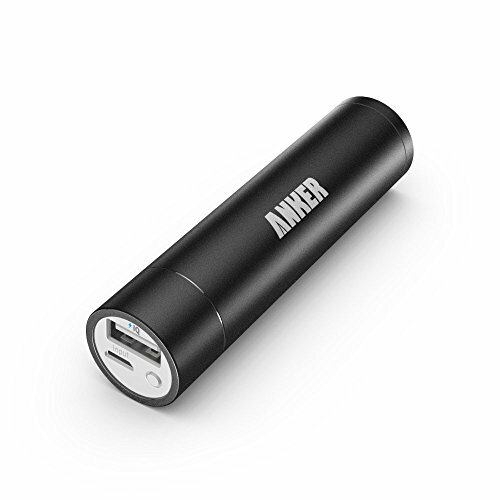 Recharges in 3-4 hours with a 0.8 amp adapter (not included) and the included Micro USB cable. What You Get: Anker 2nd Generation Astro Mini 3350mAh Portable Charger, Micro USB cable, travel pouch, welcome guide, our fan-favorite 18-month warranty and friendly customer service.